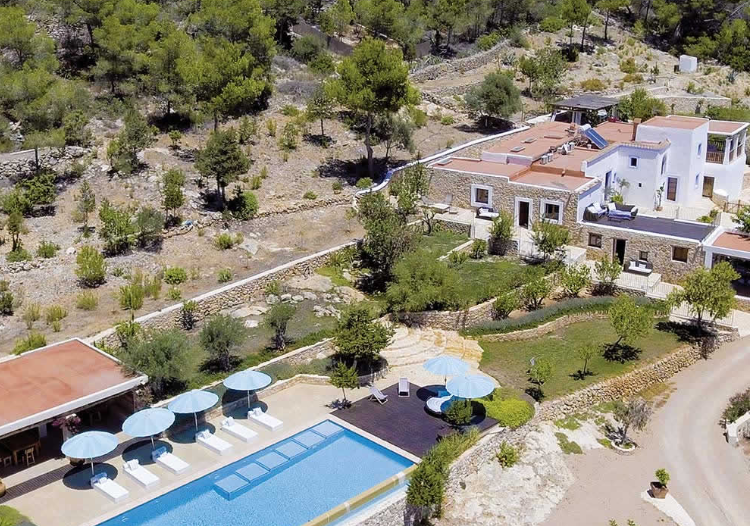 Surrounded by many small farms and olive groves, Villa Can Porchu is situated in the heart of San Antonio, Ibiza. It is also close to the tiny village of Santa Anges. The features of the villa will make to think of visiting this place without any hesitation. It is decorated and furnished in the typical Ibizencan manner to give you a taste of the local culture. The property owned by the guys at Landed Houses, who have a long history in property rentals both in the UK and Ibiza. Can Porchu is erected with whitewashed exterior walls with powder blue colour at its edge. The villa is designed creatively to maintain a balance between the traditional and modern interior furnishings. You are bound to be entranced the moment you step at the entrance of this villa. The cool water and the Roman styled swimming pool will not only catch your attention but also melt your heart. The terrace is well decorated with a breathtaking view so you can enjoy the moments even when you’re not out and exploring. Steeping inside the house you will find a very spacious kitchen with dishwasher, oven, microwave, fridge, hob and coffee machine features. The villa offers self-catering services but if you’re not feeling the energy to cook up a meal, don’t worry! There are a number of private and experienced chefs at your service. All you need to do is to book a chef for yourself and he will take it from there. The chef will prepare your meals for the whole week or the odd nights. If you’d like the house to you private, you can always try the food delivery service rather than booking a chef. Apart from that, you’ll find washing machine and a sink in the utility area and the lounge has got satellite and flat TV, DVD players for your entertainment. The bedrooms and bathrooms are quite large and furnished to perfection. Some of the other appealing facilities of the villa include free Wi-Fi, hairdryer, Bluetooth speaker and free air conditioner services. To make your lunch more enjoyable, you’ll find built-in barbecue with covered terrace as well. Can Porchu is just 30 minutes away from the Ibiza airport and the beaches at Cala Salada while Cala Gracia are 15 minutes away from the villa if you take a car. After walking 5 to 10 minutes distance from this house, you will reach the mini market in the village of Sant Mateu d’Albarca. With all these facilities in the deal, what are you waiting for? Book a trip and rent the Can Prchu right away! Villa Can Frare is yet another contender among the best villas at San Antonio city. The property has furnished itself with a modern look without losing the rustic and traditional features of it. It will give you a feel of old versus new. Moreover, this extremely private villa is near the top of a wooden hill. Early in the morning, a natural view of the countryside from the balcony is bound to make your soul filled with joy and freshness. And isn’t that why we all go for vacation anyway? Can Frare is a gigantic six bedroom estate, four of which have got their own en-suited bathrooms. The well equipped kitchen with dishwasher, a coffee machine and fridge facilities will give you the feel of your own kitchen back home. A daily housekeeper will be at your service for few hours and you’ll be provided fresh towels throughout your stay. The free Wi-Fi and free air conditioner services are also available. Can Fare offers a readily available taxi service to help you get around the city. They can collect you directly from the villa if you request for a ride. The villa has some of the best cooks who will serve you finger licking tasty foods. The cook is provided depending on the food preference of the customer. If you are a fan of body massage, we’ve got good news for you. If you are feeling lazy to go out, spend a day in and request for a body massage. Can Frare will arrange a professional massage therapists for you so you can just sit back and relax at the comfort of your own space. Those who are concerned about physical fitness, they can get an extra benefit of yoga service with some best yoga teachers on the island. The leading kayak group of the island is the kayak-Ibiza. During sunset, kayaking out will treat you with some extraordinary and exceptional moments. Can Frare also works with Ibiza Sport which is a leading bike rental company of the city. If you want to go for a bike ride or a guided tour to the mountains, they’ll make proper arrangements and have a bike brought up to your doorstep. The villa also has contacts with a number of boat rental companies that deliver traditional Ibiza and fishing boat or luxury sailing boat according to customer requirements. The external features of the villa include infinity style private pool, a built-in barbecue with dining facilities and extensive landscaped terraces. You can enjoy the lawn with fruit trees and rockeries as well. If you are with your family, then you can get extra cots and high chairs available on request. 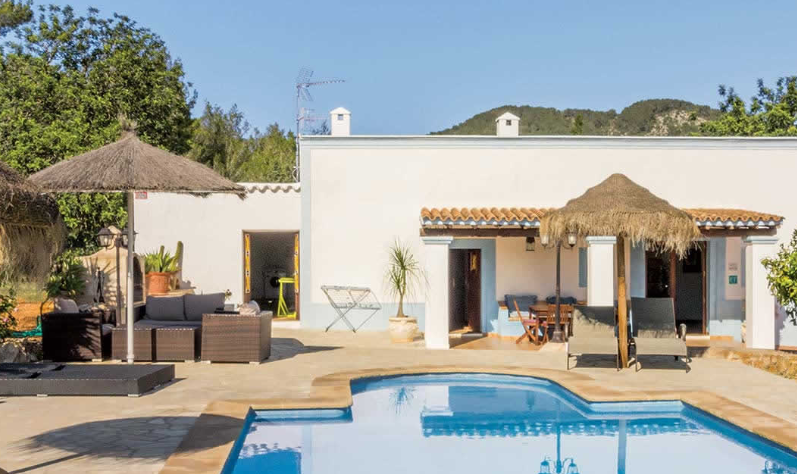 As you head south west of this villa, the famous beaches of Cala Conta, Cala Tarida, Cala d’Hort are waiting for you. The jaw dropping sunset will mesmerize you every second of the way. The villa is situated in a place from where you can explore the calm villages of Santa Anges and San Mateu. To make the experience more fun, the famous restaurant café restaurant Las Puertas del Cielo will treat you with a tempting sunset drink. It is a traditional style property that takes roughly 5 minutes from the peace loving village of San Agustin. Villa Can Vinyeta was established quite a long time ago as a country bar and shop and it has a lot of history behind it. At present, the villa has been redesigned with a new look and can be considered as one of the best places for accommodation. San Antonio is the seventh most popular city in the United States and perhaps, this is the reason behind the establishment of some of the most fabulous villas in this enchanting city. We often like to travel and visit new places to forget our daily life problems for the time being. Even, doctors and heart specialist often suggest moving to a different environment or travelling for recreational purposes to lead a balanced and healthy life. Most people find it quite difficult to choose a perfect location for refreshment since they fear wasting their hard earned money at the wrong place and ultimately ruining a potential fun filled journey. So, if you are looking to avoid some rookie mistakes while renting a villa in San Antonio, you are definitely at the right place. Hands down, San Antonio city of Ibiza will meet all your demands. To make your stay in this beautiful city more special and comfortable, you need to rent a suitable place. Here are some guidelines and a brief discussion of the 5 best villas at San Antonio to make your life much easier! Villa Can Petrus is situated outside of the bay of San Antonio. If you are looking for a quiet vacation, a place to unwind and relax from all the stress back at home, then this villa should be your perfect choice. Go for long walks on the sandy beaches near Can Petrus and feel the wind in your air. The villa is not only perfect for family get-togethers but extremely suitable for newly married couples as well. The house is well equipped and has a large space to easily accommodate up to 6 people. Then kitchen is well furnished with all necessary amenities like fridge, oven, dishwasher, coffee machine and a hob. In the lounge area, there is open plan to dining area with free view satellite TV and flat screen TV. You can enjoy movies with your favourite ones by making good use of the CD and DVD players. A rectangle sized private pool with free pool towels is one of the most attractive facilities of this villa. Besides, free Wi-Fi, free air conditioner services and iPOD dock facilities cannot be ignored at all. On the front side of the villa, there are beautiful gardens providing a beautiful view and a soothing environment. Just imagine having a cup of coffee with your dear ones at this magical house. It has probably brought a smile on your face already. Then what is there to wait for? Grab you bag, visit this place and come back again with unbeatable memories of lifetime. Villa Mortana is definitely a place worth your money if you’re looking for the best villa to rent during your stay at San Antonio, Ibiza. It is situated in the municipality of San Agustin. The house has been recently renovated and the upgrades are clearly visible to the swimming pool terraces. Those who have already visited this villa before have already made plans to rent this for their next holiday. Like all the other villas we’ve mentioned above this too has a fully equipped kitchen with a dishwasher, coffee machine, oven, microwave, fridge, tumble dryer and hob. The villa has a lounge with the flat screen TV and satellite TV. The main house has both twin and master bedrooms with patio doors to the gardens. An interesting feature: there are two bedrooms that can be individually accessed from the garden. People of any age can choose this villa because the features are best suited for all of them. There is a large freeform swimming pool surrounded by newly built sunbathing terrace is just perfect to take a bath during hot summer days. You can enjoy free Wi-Fi, free air conditioner services, free pool towels, hairdryer and iPOD dock facilities. In the external features, the villa will provide you a fantastic barbecue house and also a bar area with amazing lighting systems for the evenings. The best part of choosing the villa is the beaches of Cala Conta and Port d’Es Torrent that will take 1j0 minutes to drive from the house. Who doesn’t want the best things for themselves and their family? Entertainment, fun, travelling, reunion of friends and family get together are some of those best things we are taking about. The 5 villas of San Antonio in Ibiza are the most suitable destinations to spend a memorable holiday period with family or friends. These villas have it all to entertain you on your every second of staying there. They are near the beach areas and the quiet environment of the surroundings will definitely help you feel relaxed and unwind. So if you are tired of your daily hassles and badly need a vacation to escape the madness of everyday life, go for these amazing villas to make your stay in San Antonio all the more fun!